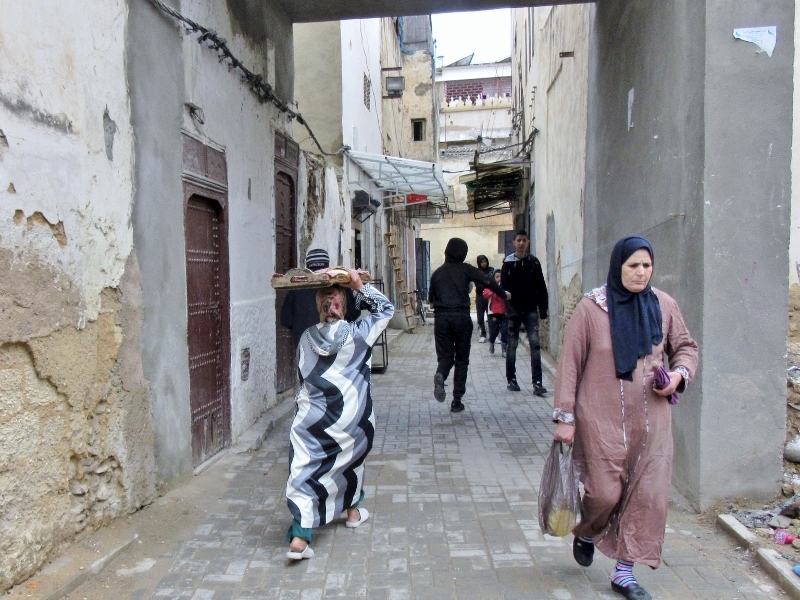 We arrived at Ryad Alya in the old Medina of Fès long after the sun had set, following a couple of young men who “offered” to show us the way to our hotel down the dimly lit and narrow lane and piled our small suitcases in a hand cart. After tipping them and then upping the tip a bit more when they made the face that we became very familiar with during our time in Morocco – basically a grimace conveying the meaning that we were stingy foreigners who had shown disrespect for those who had labored diligently to meet our every need, whether requested or not – we finally escaped into the opening door of our hotel and into another world. Hassnae, an attractive young woman dressed in skinny jeans like any university student in her 20’s, welcomed us into the riad, a traditional Moroccan house of three stories built around a courtyard. Furnished with linen-draped dining tables, the large space had a comfortable feel with couches here and there along the walls for enjoying both the bubbling fountain and a garden with orange trees. An elegantly dressed gentleman in a suit and polished black shoes was seated unobtrusively in a corner, plucking at the strings of a lute producing a soulful melody for the only couple dining. Hassnae seated us in a lounge off to the side of the courtyard and served us little cups of mint tea, heavily sugared and pretty cookies that, since it had been awhile since our last meal on the road, we wiped out without much ceremony. She then showed us to our room, thankfully equipped with its own heater as the rooms around the garden were all open and it was cold. Finally, we were able to shed our fleece vests, scarves and coats which we’d worn during our day of travel from Tavira, Spain to Tangier, Morocco and then to Fès. The beds were rock hard and weighted down with heavy blankets that kept us pinned beneath them but we had no complaints. Actually, despite the late night sugar, we slept like we’d been heavily drugged. A tour of the riad the next morning, led by another friendly and pretty staff member named Shaimae, filled us in on the details of the paradise in which we’d found ourselves. 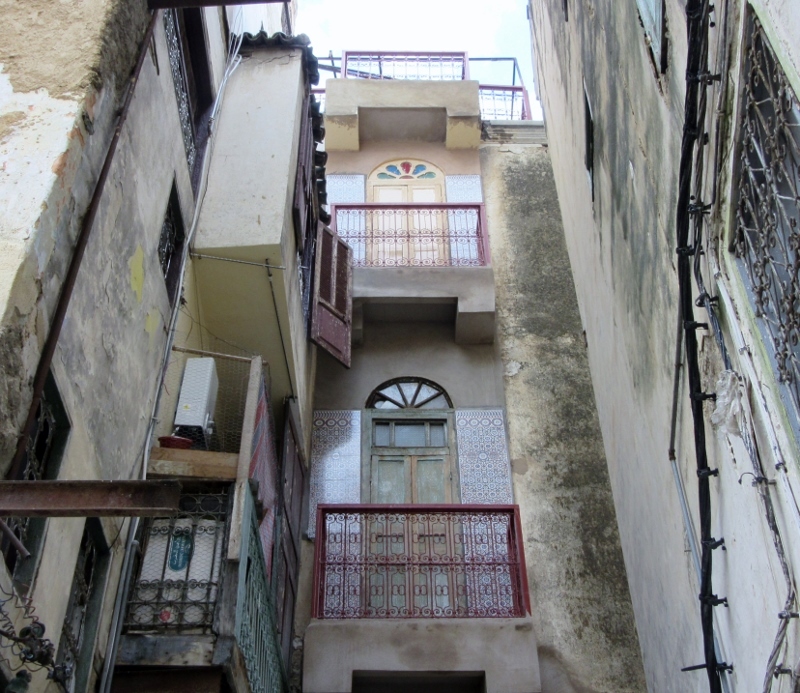 Riads, once the fine homes of a city’s wealthiest citizens, lack windows on the exterior walls. The architectural style is what Wikipedia calls an “inward focus” and opens onto the interior courtyard which provides the family complete privacy from the outside world. 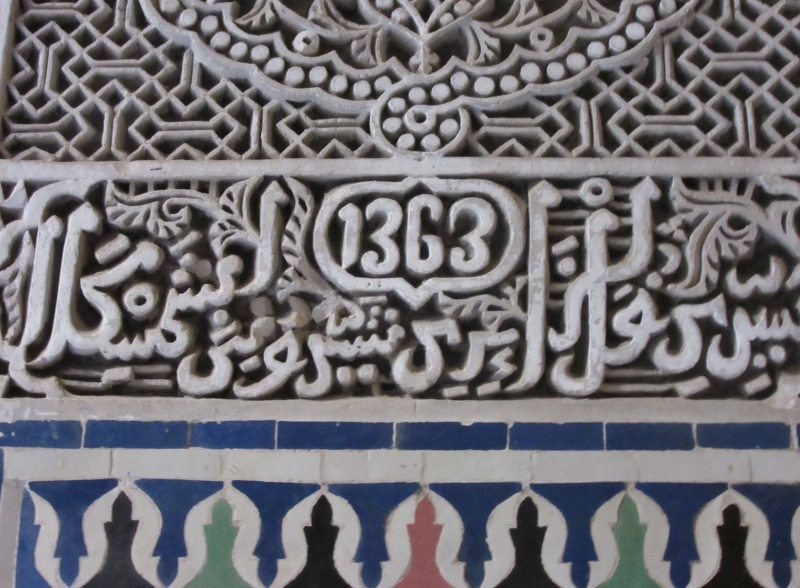 Our riad, Ryad Alya, was originally built in (no typo!)1363. The current owner whom we met that evening, Kholid Filoli, was an articulate, well-traveled Moroccan who spoke glowingly in English of his visits to the US. 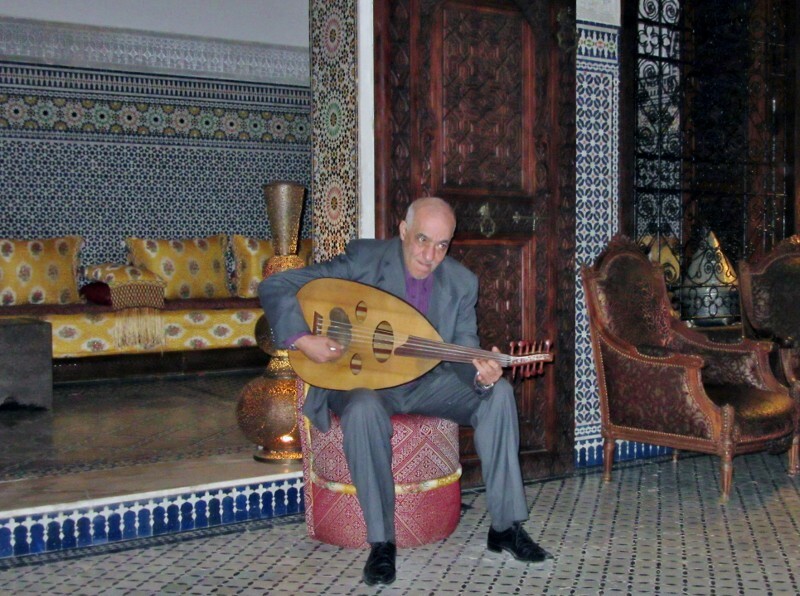 He’d bought the riad in 2003 for his wife, an accomplished painter and his daughter, an architect living in Geneva. The ancient house was renovated by skilled workers who spent three years returning the home to its current glory and converted it into a hotel with five beautifully furnished suites and three less expensive, but no less comfortable, rooms with their own private baths. The walls were embellished with designs in the carved plaster and zellige tilework, “a form of Islamic art” that features geometrically patterned mosaics. We’d decided to explore the Medina on our own the first day and we set off with maps in hand. The Medina of Fès was designated a UNESCO World Heritage Site in 1981 and is said to be the best preserved old city in the Arab world. Covering 540 acres, it’s also the world’s largest car-free urban zone and goods are brought in by donkeys, mules and hand carts. Called “The Mecca of the West” and “The Athens of Africa,” this ancient walled city is actually divided into two medinas, the Fès El Bali or Old Fès dating back to the 9th Century and the “new” part, Fès Jdid, which dates to the 15th Century. In this area that surrounded us with its sense of ancient history and present activity are great open spaces of gardens with sparkling fountains and avenues. These skirt narrow streets funneling foot and animal-drawn traffic into lanes and crooked paths where it feels like a great crowd of humanity is pressed around you, engaged in the business of daily living. 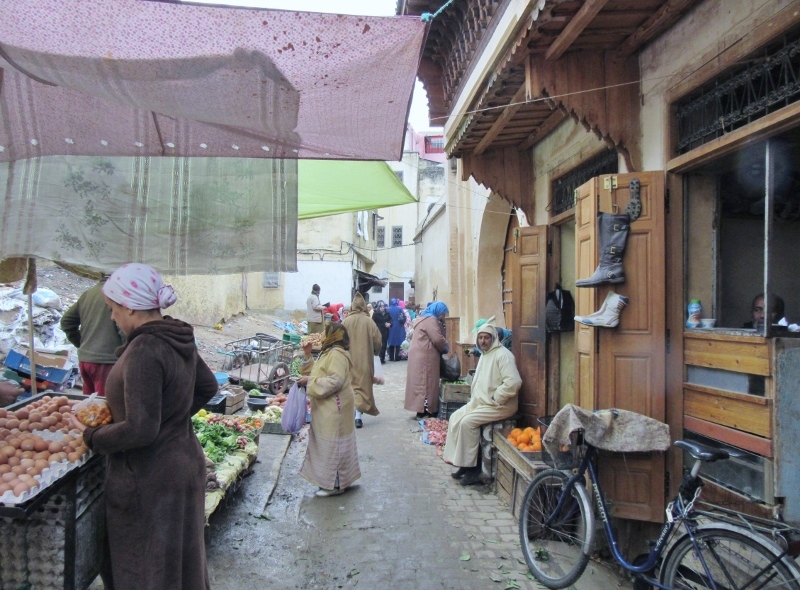 Surrounded by walls, the Medina’s space has remained the same for centuries as the number of its inhabitants has increased exponentially resulting in overcrowding – probably not the best experience for anyone who suffers from claustrophobia. The passageways wind around in a labyrinth with age-old buildings of three and four stories abutting them and as the streets twist the sunlight overhead is partially blocked. Behind the walls of these ancient buildings in various states of crumbling disrepair and ongoing attempts at restoration, are other warrens of buildings built around interior courtyards where thousands of people preserve customs and traditions passed down through the millennia. In contrast to other parts of the world, Jews and Arabs have coexisted peacefully for hundreds of years; there’s an old Jewish quarter occupied by a dwindling population as well as the Ibn Danan Synagogue dating from the 17th century. Throughout the Medina are schools for secular learning and madrasas where the religion of Islam is taught. Groups of children passed by us greeting us in Morocco’s unofficial first language, French, with “Bonjour Madame et Monsieur,” the boys in street clothes and the girls uniformed in white coats resembling lab jackets worn over their street clothes. Open shops on the ground floors offer anything a shopper could want: leather goods, jewelry, dried fruit and herbs, ceramics and metalware, every day and finely embroidered clothing for special occasions. There are bakeries where families bring their bread daily to bake in communal ovens and butcher shops with fish displayed on ice next to pharmacies, barber shops, small cafes and restaurants. Lining several of the twisting lanes were other vendors conducting an informal farmers’ market with brightly colored fruits and vegetables piled on makeshift tables. Heavily laden donkeys and mules led by men in peaked hooded djellabas passed by and there were women completely veiled as well as those wearing robes and headscarves along with many younger women in western style clothing. We were completely lost and completely caught up in the full sensory overload of sights, sounds, smells and tastes of different foods that we tried here and there. We gave up on trying to figure out where we were on the map and wandered for a few hours trying to absorb the completely exotic, chaotic and alien world. And finally, after brushing off multiple offers from the unofficial guides that appeared here and there with offers to show us selected sights and shops with “special” bargains, we struck up a conversation and agreed on a payment with a young man who pointed out places of interest as he helped us find our way back to Ryad Ayla for some much needed tranquility. The sense of history surrounds you in Morocco and it’s so amazing to think of people still living in buildings that are many centuries old! And next time you’re in the neighborhood Nancie, we’ll meet up in Morocco and do some more traveling! I love the mosaic architecture they have in Morocco, great photos! Thank you and we have to agree about the mosaics. The tiles are gorgeous and the different patterns combined with the carved stucco and other brilliant colors and shapes are fantastic. One of our favorite things to see in Fes was a ceramic shop where we watched men actually chipping out the mosaic shapes and inlaying them according to a template. It’s fascinating to see the skill and patience that goes into creating a mosaic! I love the idea of the riad and how it gives privacy as it has no windows in the outside but it opens up inside. The medina is also fascinating but with my poor navigation skills I would most definitely need a guide. Thanks for your lovely pictures and taking me along on your Morocco adventure. The concept of the riad’s inner courtyard reminded us of the classic Mexican interior courtyards and how much we loved the idea of incorporating the outside into a home’s space. We caught occasional glimpses of the the interiors of some of the places throughout the medina and it was fascinating to see some of the richly appointed furnishings compared to the shabby exteriors. Quite a different idea from where we come from where wealth is displayed openly! We’re planning another visit to Morocco in a few months and, by all means, you should follow your dream of a visit to this fascinating country too! Fes turned out (surprisingly!) to be our favorite city among the ones we visited, perhaps because it didn’t seem to be over run by tourists. And, as for the food – amazing, including the fava beans! We finished walking the Camino de Santiago 5 days earlier than planned (you know what they say about plans) which left us with about 1 week to fill before we caught up to the rest of our itinerary. We looked very seriously at crossing over to Morocco with our 2nd choice being Porto, where Abi had been, but I had not. Since I am 1/2 Portuguese and had never stepped foot in Portugal, and since neither of us felt we were prepared to take on Morocco, we headed to Porto and of course fell in love with the city. We do still talk about crossing over the sea to Morocco one day and your post is makes it all the more enticing. Your line about Fava beans was so funny. I hate Lima beans, but love Fava beans. Funny I should happen upon your post about Fes (he spells it Fez), as an online friend of mine was just telling me it’s on the top of his Bucket List (to return to.) He’s already been there and LOVES it. After seeing your amazing photos, I can see why. Hi Doreen and thanks for stopping by. Fez/Fès/Fas has several spellings and pronunciations which reflects the many cultures that have influenced it over its 1300 year history. I can well understand your friend’s wish to return for another visit as there are so many things to see and do and places that we missed and would love to visit. The country of Morocco is fascinating and, from what I’ve seen so far, Fez is its jewel! Morocco has been on our list for a long time. You make it sound magical. Your descriptions remind me of Cairo without the chaos. Morocco was a mixture of magical moments and total sensory overload! Your comment “without the chaos!” has us wondering about Cairo now … Egypt has long since been on our list and, even now and despite the random attacks, we hope to visit it soon and maybe see how the two ancient countries compare. What a thrill to stay in a riad with such history! You are wonderful storytellers and photographers. 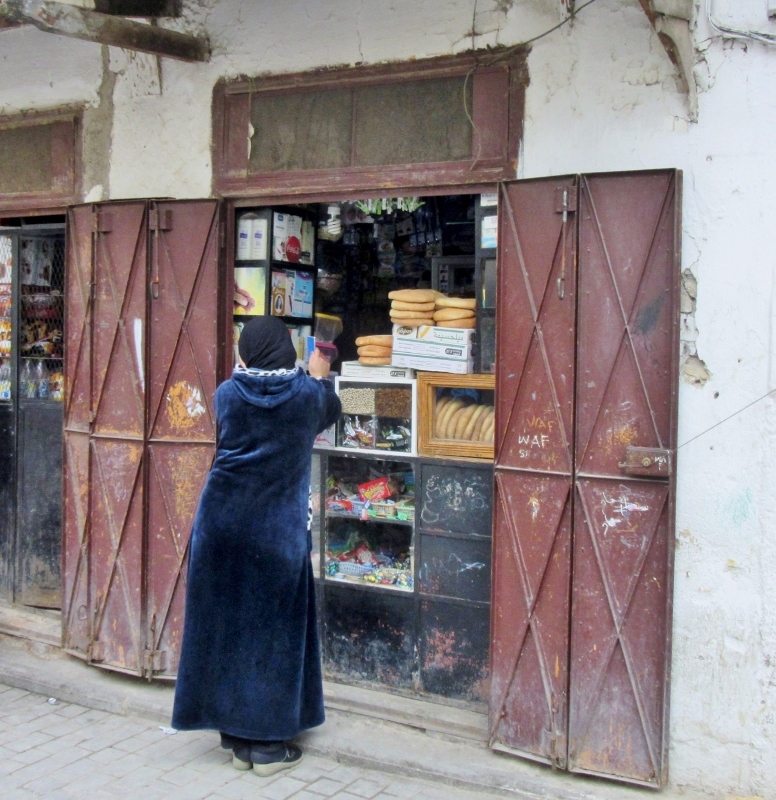 I wondered what it was like to “stick out” as Westerners when you visited the medina. Thanks so much for your lovely comment, Irene. After our travels in Central and South America we’ve gotten used to sticking out some (it’s that blond hair!) but I think that Westerners are far from rare in the Medina, especially since its a UNESCO site. Luckily we were there during the low season because I can’t imagine trying to make our way through some of the narrow passageways packed with the residents, the animals hauling various goods and large tour groups! Our daughter went to Morocco last year and loved it. Hate when the kids get somewhere before us! 😉 Great pictures, really makes us want to visit. Sounds like your daughter has a bit of the travel itch too, Veronica! So glad you enjoyed our introduction to the Fès Medina and a Riad and we think it’s an experience you would find as fascinating as we did! Definitely worth a visit if only to tell your daughter that you loved Morocco too! Fez is fascinating and crazy with all the small alleyways and crooked streets of the old Medina, I loved this city and it’s amazing attractions. I do agree the guides were very aggressive in Fez but harmless. Wandering about the Medina on our own and then having a guide show us even more places hidden from casual view gave us a huge appreciation of Fès and its history and culture. Absolutely fascinating and we would love to spend more time there! We’d read a caution about the “unofficial guides” and there’s even a fine if they’re caught (although we didn’t notice any tourism police) and most seemed to accept a “No, thanks.” In fact I got the impression that the law was in place not because of any real danger of theft but to safeguard the registered guides and established tourism industry. I loved Morocco. Went there 5 years ago but didn’t spend enough time in Fez. I wish I had stayed in a Riad, but was on a tour. Lovely that you also had the rooftop terrace. The medina was one of the highlights as was seeing (and trying) all the different foods. We loved our stay in a traditional riad. The rooftop terrace was beautiful and it was great to see a partial view of the surrounding Medina. 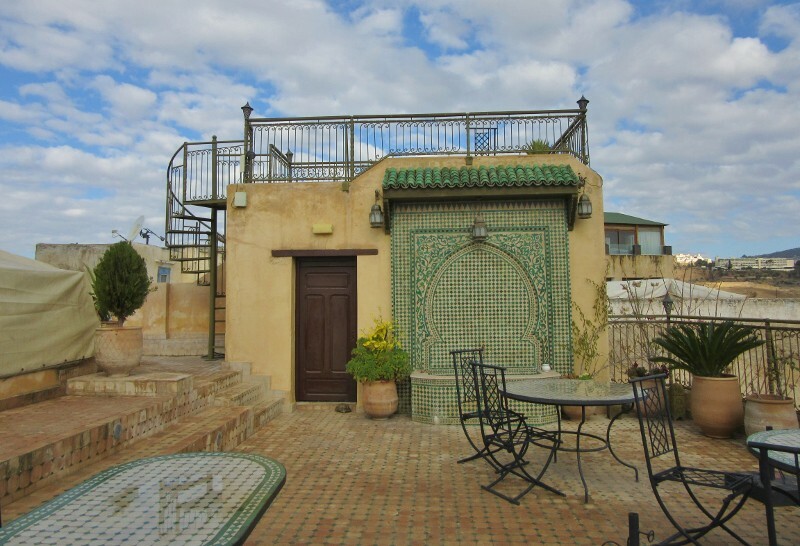 I imagine that spending time atop the riad would be very pleasant but February was way too cold for us to enjoy it for long! We also loved trying a whole new cuisine, especially the tagines, and washing it all down with lots of sweet mint tea in pretty glass cups.! Your description of Fes brings back memories of my visit to Tangier many years ago. 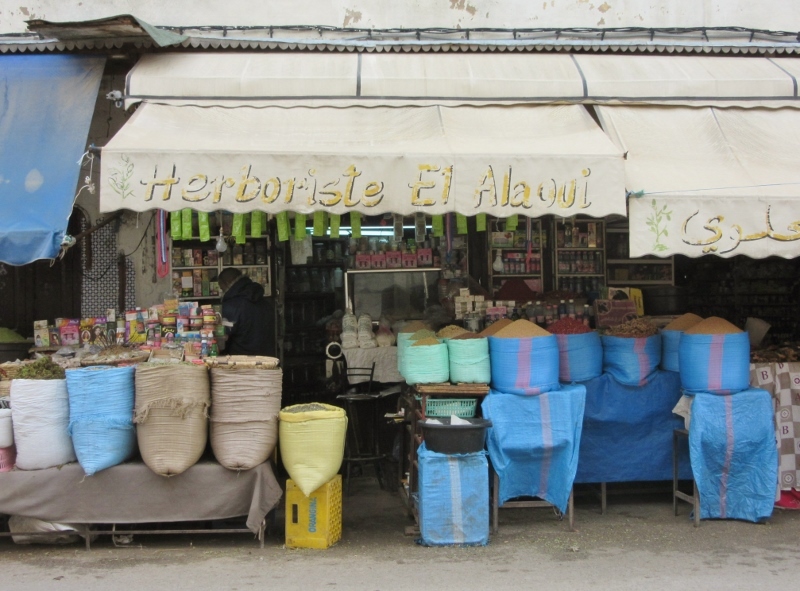 It had a similar kind of medina area with the same narrow stone streets, shops plying you with mint tea and, of course, lots of locals determined to be “helpful” to tourists! We brought back a big bag of mint tea from Morocco and enjoying its aroma and distinctive flavor brings back some very good memories! I think we’ll spend more time in Tangier when next we visit. It’s always hard to choose between places to spend one’s time in when traveling but luckily we’re close enough that we can see new places the next time around! I had always assumed that Marrakesh was the place to see in Morocco, but Fes sounds like it’s less touristy and just as interesting. 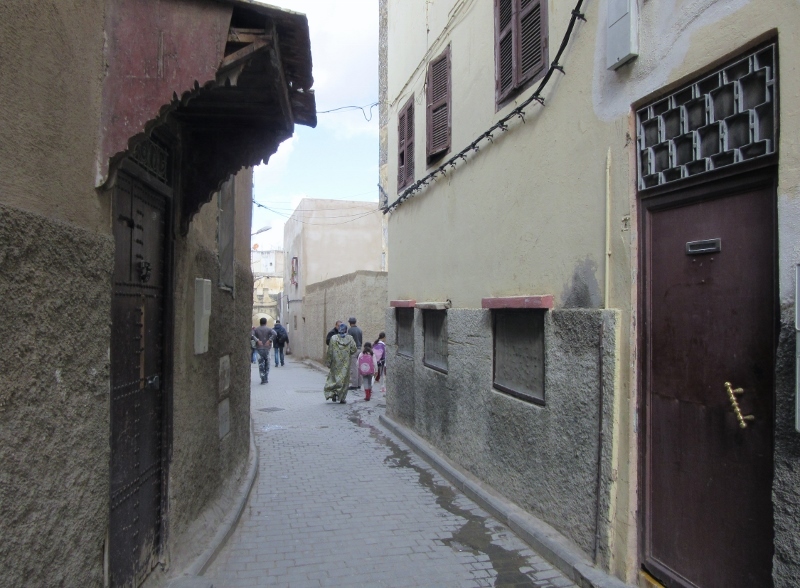 That riad looks like it would be a welcome retreat from the claustrophobia of the streets. The Ryad Ayla was lovely and the staff was amazing, always ready to answer questions about their culture (present and past) and history as well as offer tips on places to see. Fès is fascinating and, while there are similarities between it and Marrakech, the tourist atmosphere was much more toned down, That said ( and maybe because of the many popular rock songs!) Marrakech is also worth some time exploring its medina and UNESCO site too. What an amazing place to visit! The accommodation looks out of this world, and actually, the decoration very similar to what I’ve experienced in Portugal. Maybe the Portuguese went to Morocco at some point in their past. Aw those Portuguese – they were definitely explorers and travelers! 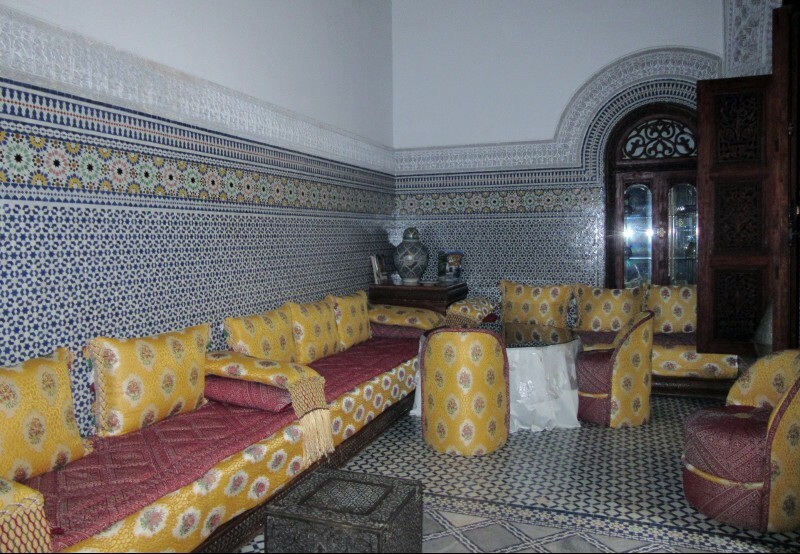 However, I think much of the Moroccan decor that’s found in Portugal is from the Moors who inhabited so much of the country, especially the Southern areas, centuries ago. It’s amazing to see the way the cultures merge in language, art and architecture isn’t it? Hi Guys – Taking notes here. Fes and Essaouira it may very well be instead of Marrakech. It was disappointing to realize when we were in the Canaries last year that we couldn’t hop straight (and inexpensively) over. There are so many unique places to see in Morocco and avoiding some of the bigger cities might be more fun when we visit again. It’s great to have such an amazing country nearby and our next trip there we’ll have a better idea of what to repeat and what to avoid! You’ve painted (with photos and words) a fascinating picture of Fes. I’d love to get lost in those streets and then return to that riad. It certainly looks like a lovely oasis. Thanks Donna – All of our map reading skills were for naught after the first few turns. Everything was so completely foreign and interesting that just slowing down and taking it all in without worrying about where we were was the best thing to do. And by now we’ve been lost enough times that we know we’ll find a way back “home” eventually! We have Morocco on our ‘list’ of must get to places and these posts are killing me with desire to do so. I can’t tell you how much we look forward to your posts! Keep them coming! If you haven’t yet read Paul Bowles – his novels or the collection of his travel stories — you should. I credit him with sparking my interest in that area. Happy Easter! Same here. I loved the book and Joel thought it strange. Oh this so makes me want to go back to Morocco and the Fes medina. I was there about forty years ago and have never forgotten it, but I didn’t stay in riad – that would be a lovely experience. You’d love staying in the riad, Alison. It was a wonderful experience and the staff went out of their way to make us feel like we were part of a family. There’s a wide price range between the rooms so you can splurge or stay within your budget and the meals (feasts!) were delicious but very reasonable. We took advantage of the services offered by a very talented masseuse and only learned as we were leaving that the staff would have arranged some cooking classes for us as well (ah – those tagines!) Definitely a good reason to return! OMG! Firstly, l immediately thought of Hannibal Lecter as l saw fava beans and totally cracked up! Great minds think alike. It is almost eerie how much this reminds me of Marrakesh. It’s only to be expected of course, but still. Our Riad looks awfully similar too. I love how people come back to restore these old grand places. Ours was owned by some French Expats who did a really nice job invoking the days of old. We ended up getting lost in the medina too, we fell for the upping the tip once, but by the second night..nope..no matter what sulky face they gave us. I love this post. Wonderful history, it makes me want to go back to Morrocco, but of course it has to wait..no double dipping..haha..gotta cross some off the list first! LOL – those fava beans! 😀 There are a lot of similarities between Fès and Marrakesh, especially in the Medinas but we found Fès to be (thankfully) a lot less touristy. Plus, the vendors weren’t as aggressive nor the unofficial guides quite as persistent! And we have to agree with you, Kem Kem – as much as we liked Morocco and plan to return, there are so many more new places to explore first! Wow. What an experience. I have always loved the Moroccan architectural style. I also admire your willingness to get lost in new places. It’s something I love to do, but I think the medina would be challenging. Glad you made it out! Finding our way in the Medina was a huge challenge (that we failed!) and once we left the wider streets we were quickly lost. The maps were absolutely no help for trying to navigate the maze. But, since we’ve been lost many times in our travels, it’s no longer as frightening as it once was. And there was no shortage of young men readily available (at a price) to show us our way out. Great pictures and descriptions! It looks pretty cold, not what we’d imagined in North Africa. We’ll put Morocco on our bucket list. Keep it coming! You’re right – Fès was cold! Like you, and thanks in large part to many of the movies we watched over the years, we’d always pictured North Africa as hot. Luckily we googled the weather before we left and included more clothing to layer. However, it’s probably preferable to visit the interior part of Morocco in February as the summer months are unbearably hot and can reach up to 40°C (104 °F) which would really be uncomfortable! Thanks again for the great info. Be well! Thanks so much for sharing your exciting adventures with your FANS. Ha-Ha Maida. All we can say is, “Thanks for being our best fan!” It’s fun to share our travels with you. Maybe we can talk you into a visit to this part of the world someday. Morocco looks amazing. The pictures are wonderful and I love all the history. Great post. Thanks for the wonderful descriptions that make it all so real. Thanks Suzi and you’re right – Morocco is an astounding place to visit. Its history, both ancient and in the near past is fascinating; we only scraped the surface trying to make a bare-bones timeline to help us understand the country. Lucky for us, we have both the instant gratification of the availability of online information when we want to learn more plus the county is not too far away so we can go back for another visit! You’ve described it all so well that I felt I was walking those streets with you. I’m looking forward to the next installment! Thank you! Just like the saying, “The more the merrier!” I think writing about the places we visit makes us much more observant (and better) travelers while enhancing our experiences. It makes a place much more memorable when we focus of the details like the sights and smells that surround us or the people that we see and meet. That looks exactly like the Riad that I stayed at in 2011 but it was called the Layali. The decoration and furnishings are so similar. Maybe it was the same owner! I enjoyed this post it gave me a big memory nudge! We’re so glad that our post sparked some good memories of Fès and your stay in the Riad Layali. 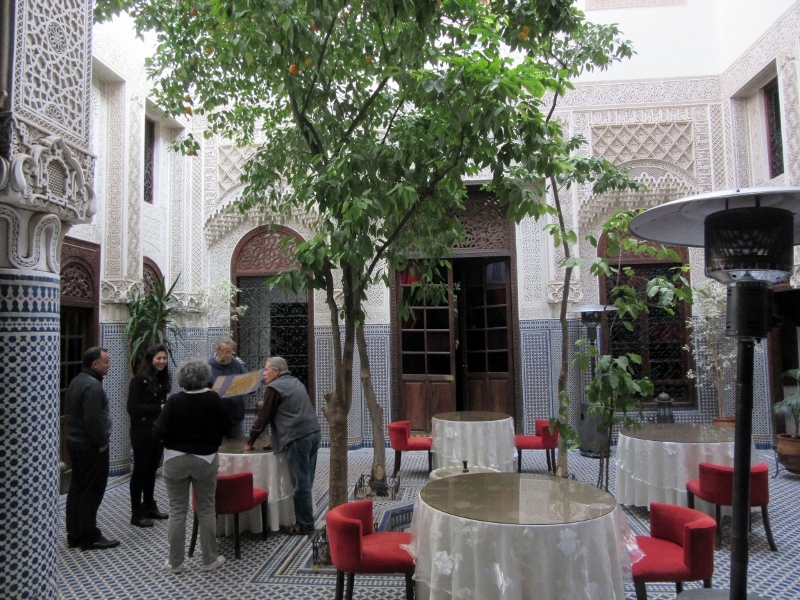 I wish we’d thought to ask to visit some of the other riads in Fès – it would have been fun to see the differences in decor although I imagine that many of the traditionally decorated riads have many similarities as well. (That might be a great reason to return!) I love all the intricate patterns of the carved stucco, colorful geometric tiles, woven fabrics and rugs that somehow all come together to create the lavish surroundings. I had to really examine my photographs to be sure it wasn’t the same place. I enjoyed Fès even more than Marrakech! We also liked Fès much better than Marrakech, not the least because of the very aggressive vendors and “guides.” Even though Fès was our first experience with the very foreign culture, we felt much more welcome there and able to immerse ourselves into learning about the history and traditions versus the carnival atmosphere in Marrakesh. Interesting because we found the reverse to be the case. 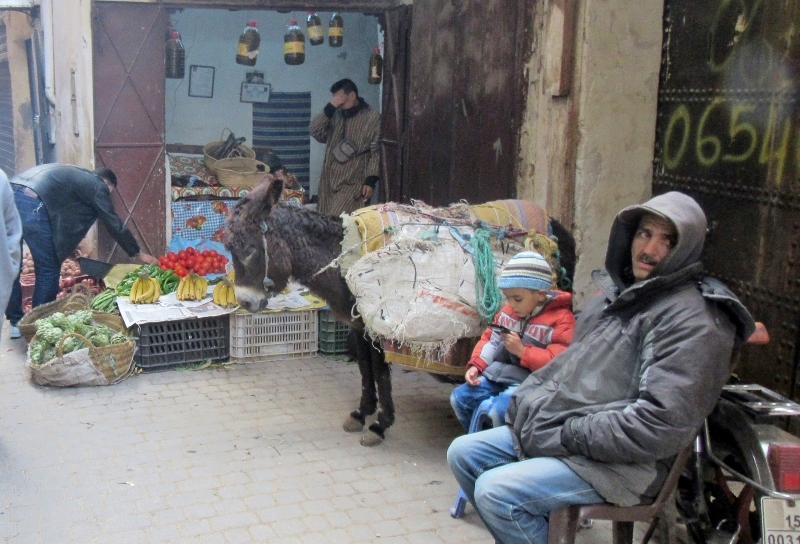 In Marrakech we found it irritating to be hustled so persistently by the vendors but in Fès we found the men seeking work as guides to be quite aggressive. 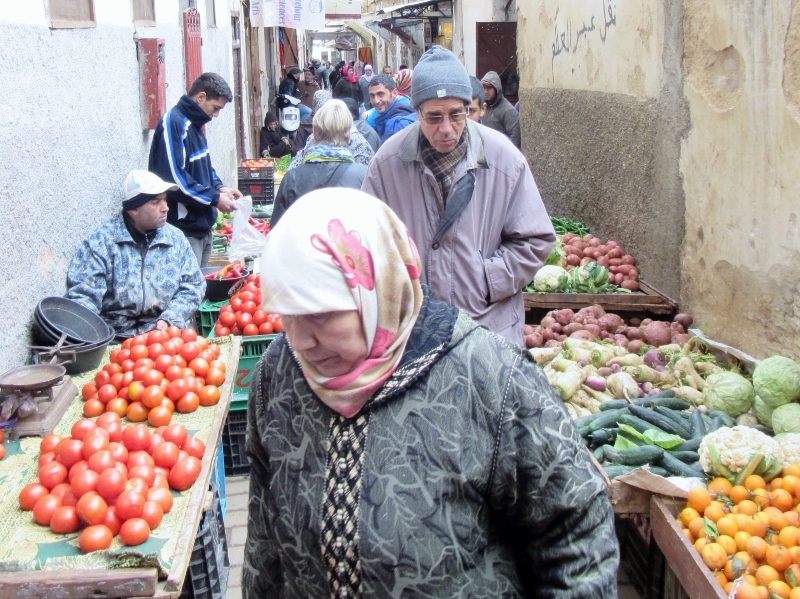 We also likes Meknes were there were far fewer tourists and traders were more interested in local customers than a handful of Europeans. After Fès we said that we wouldn’t go back to Morocco but earlier this year there were cheap flights to Essaouira which we just couldn’t resist. 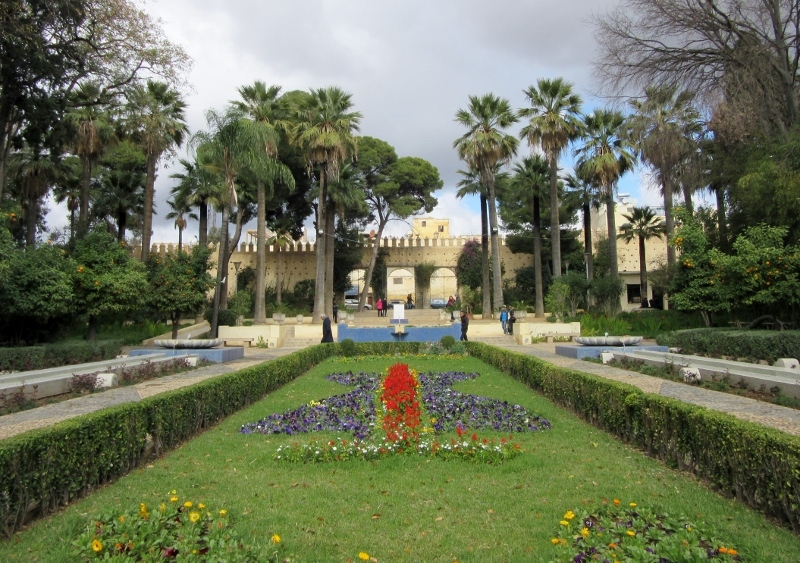 We found it charming and welcoming and it put Morocco firmly back on the tourist trail for us. Since Morocco is so close we’re sure to visit again but I think we’ll check into spending our time in some of the smaller cities like you. 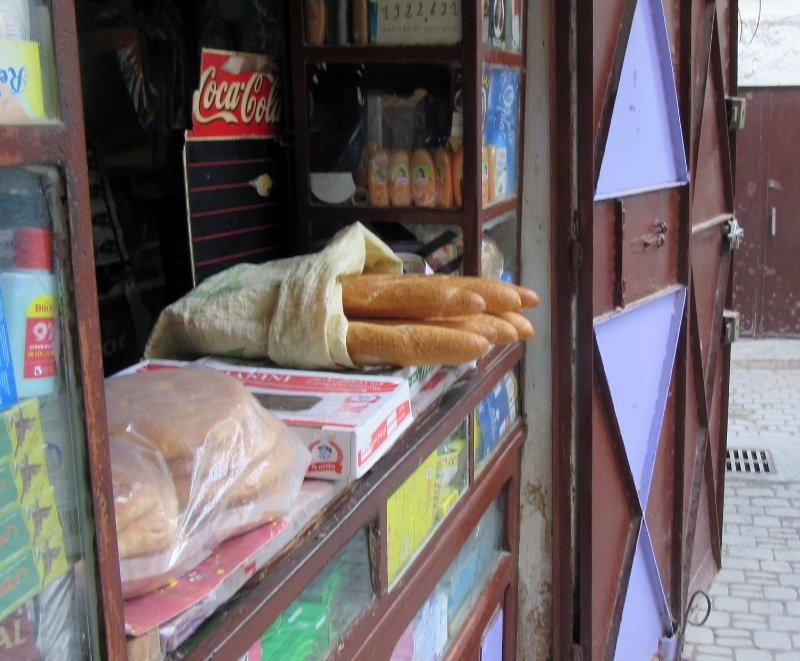 We took a day trip to Essaouira and loved it – very laid back and the countryside was beautiful. 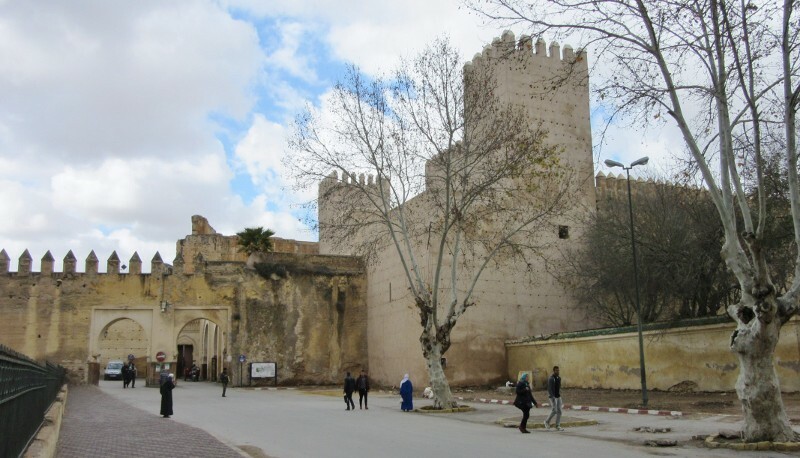 And thanks for the tip about Meknes – we’ll have to check it out.